Another rumor has pointed toward a June launch for Apple's updated all-in-one desktop, the iMac, featuring Intel's latest Ivy Bridge processors. Original design manufacturer Quanta Computer and chassis supplier Foxconn Technology are expected to be key suppliers for the new iMacs, according to the Chinese-language Economic Daily News, via DigiTimes. The report issued Friday cited sources in Apple's upstream supply chain. The latest report comes on the heels of a separate rumor issued Wednesday that also claimed Apple is planning to release new Ivy Bridge-powered iMacs in the coming months. That report claimed the new desktops would arrive in June or July, while Friday's latest support singled out June as the month for them to launch. Both reports said that the new iMacs would feature Intel's Core i5 and Core i7 processors, based on the new Ivy Bridge architecture. Those chips are expected to launch later this month on April 29. Friday's report also reiterated its previous claim that the next iMac will be thinner and feature anti-reflective glass displays. That would be a first for Apple, which has previously only offered anti-glare purchase options on its MacBook line of notebooks. The iMac lineup was last updated in May of 2011, when Apple added high-definition FaceTime cameras as well as high-speed Thunderbolt ports. 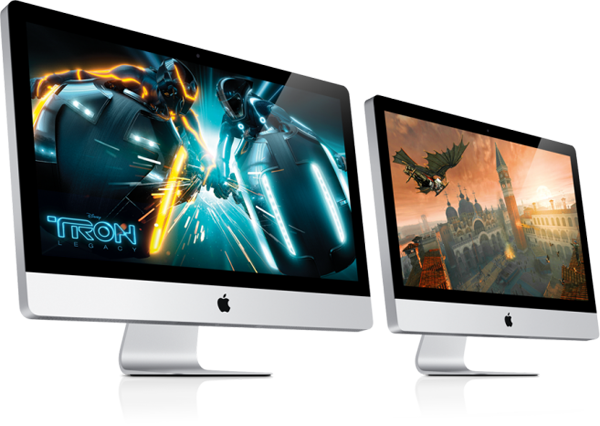 The current iMacs are powered by Intel's Sandy Bridge processors and AMD Radeon HD graphics. Finally, DigiTimes also said that Apple is set to launch new MacBook Pro notebooks, which will also feature Ivy Bridge processors, at the end of the second quarter of calendar 2012, which concludes at the end of June.